Every year, I hear people saying that they want to do more in the coming year. I was one of them. More time for myself, more time to play, more time to enjoy life and so many ideas at the beginning of the year but then life would be just the exact same! How can you do more when the number of hours in the day are just going to be the same in the next year too, right? Then I learnt the secret to accomplishing more. I didn’t need to do more. I needed to plan. The best way to get more done is to be smart with the time that you already have. 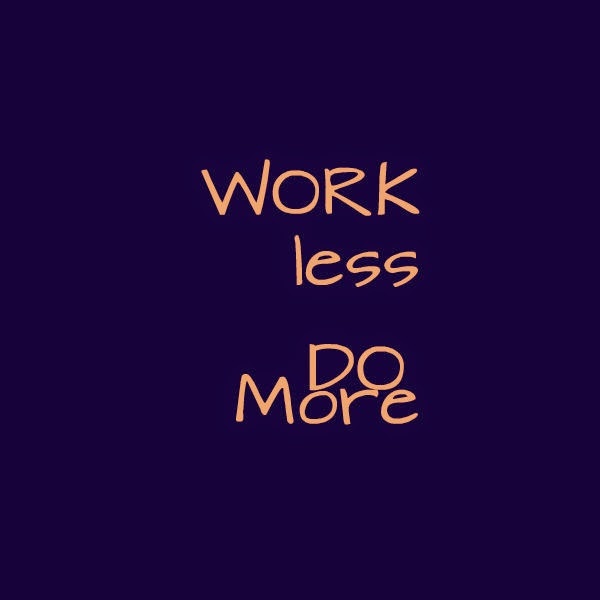 Work less and do more. Never do Everything At the Same Time, that is. 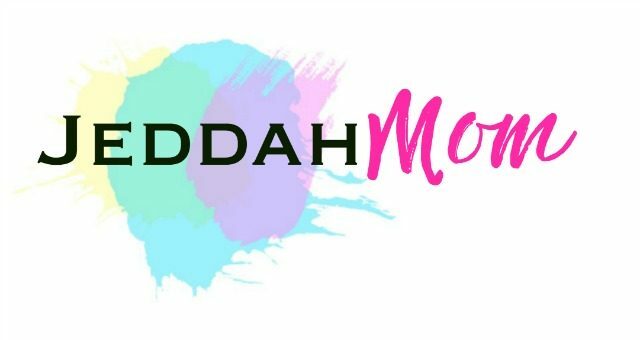 We mothers feel super humans to multitask… in fact we take pride in it! But… it is totally wrong! When you have too many projects going on, it means that you are juggling. Juggling requires lots of concentration and lots of energy. It is just not possible to give your 100% to juggling life all the time. When you have too many projects running it means that if you drop the ball there will be too many unfinished jobs. It also means a greater chance of a burn out. The wiser thing to do is to take one project at a time and finish it out. A better way to manage time is to pick one thing and finish it. I have a list of things that I never do. Yes, a NEVER list. IT has made me more productive and less stressed. 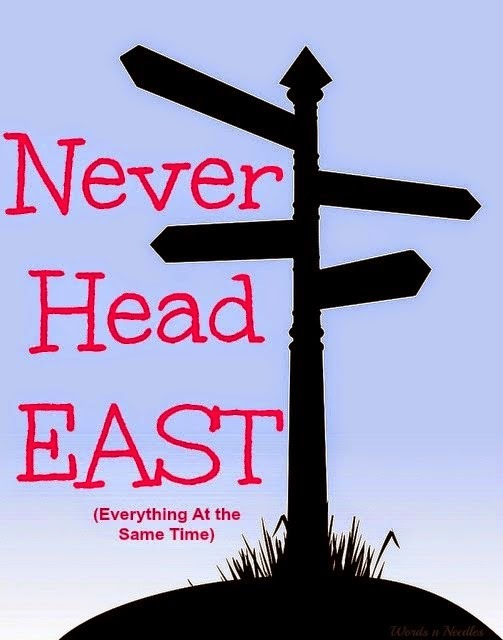 Read here about time management and how to Never Head East . One of the ways I never head EAST is to break down my projects into smaller do able tasks. I also get my family to help me with it by making small ‘5-10 minute only’ fun tasks for them. 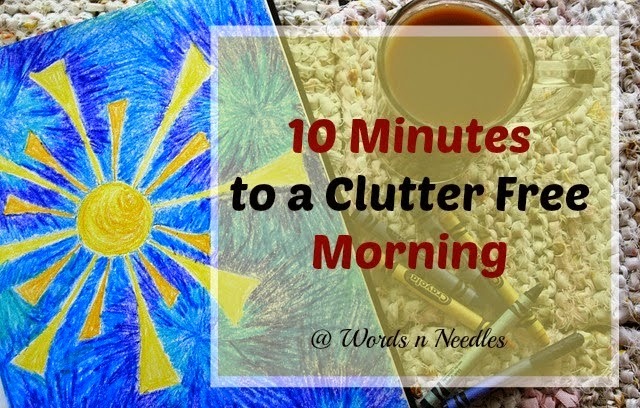 It is possible to break down you entire list of chores to just a few minutes a day. 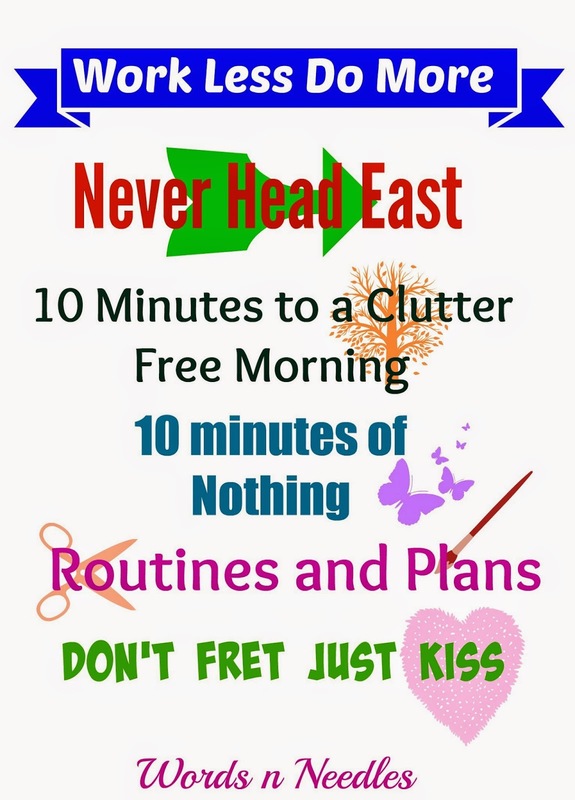 If you can’t do them through the day then, do it at night like I do it in my 10 Minutes to a Clutter Free Morning. 3. 10 Minutes of Nothing. The best way to make sure you are capable of doing more is by starting out fresh. I swear by my 10 minutes of nothing everyday. I don’t have a set time of the day for it as I prefer to take it when I really need it the most. It is like building your steam. 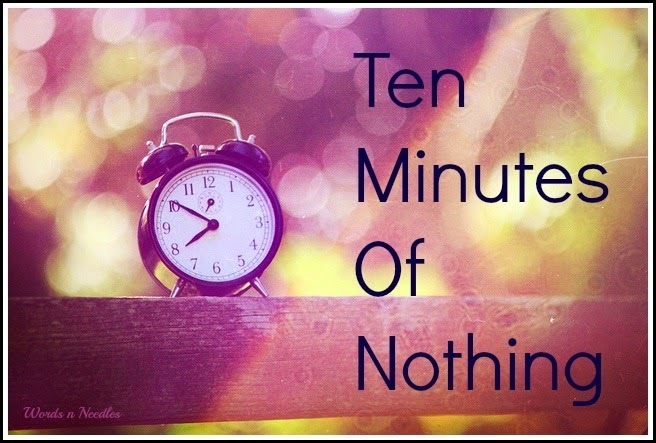 Read how to have those ten minutes and when here. It works to have a plan. It also works to have some structure to your children’s day. When everyone know what they have to do and what is expected of them, work gets done faster. 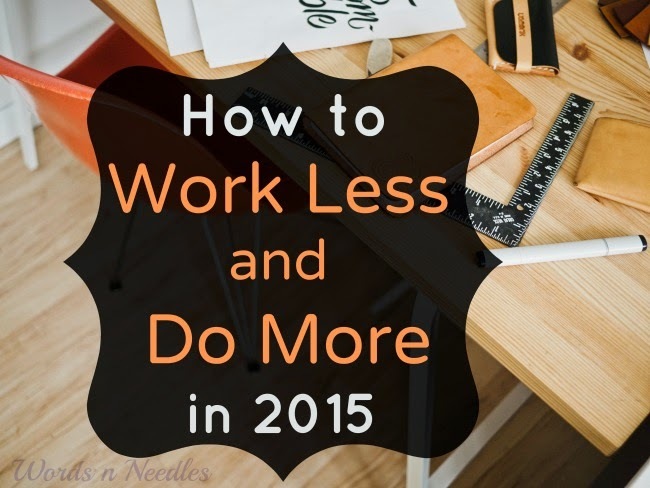 I have already started on my Work Less Do More Goal this year. On New Years eve, my son and I made a new Chore Chart for ourselves. Since my husband is always working and I am left to do so many things myself. I have found that getting the children involved with house work, makes them feel like contributing members of the family. It makes them feel so ‘grown up’ too. Since you are giving them the ‘power’ to help and do things, they behave better. Ofcourse, sometimes a simple job such as arranging the shoe rack takes more than an hour when my two year old is doing it but… she is learning and playing at the same time! That day, Son and I got enough time to vacuum our apartment too while my brother took the girls away. This is another thing that I love to take advantage of. When you have little children in the household, it can take so long with all the distractions. I love it when I can get someone to take the little ones out. I don’t like getting someone to baby sit in the house either. Just send them out because if they are at home, they will still want you. You cannot concentrate on the job at all. I am always very thankful when my siblings or husband offer to take them off my hands. It really amazes me how much I get done in just three hours! If you have the option of getting someone to take your children out, I highly recommend you do! Children behave better when they have a routine themselves. Since they have a set time for sleeping and they are well fed, they are less stressed. You can read more about Routines here. The best way to get more done is by making things simple. 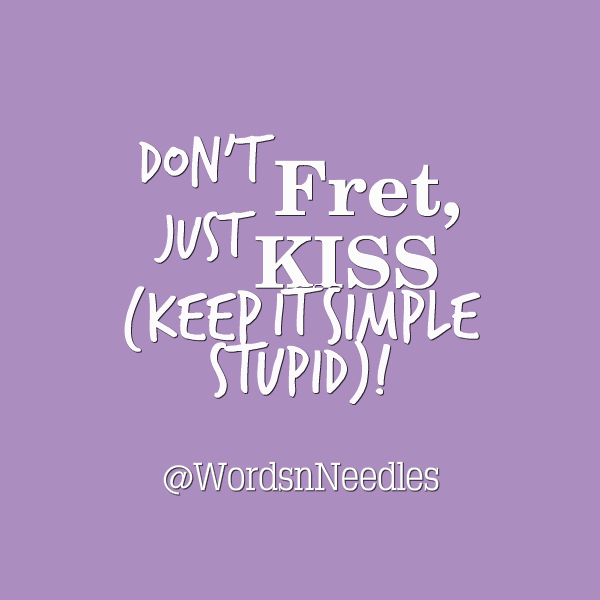 The acronym Keep It Simple Stupid is how I remember things. Every time life gets chaotic and too cluttered, I remind myself time and again to declutter and keep things simple around the house. Don’t bring in things that you don’t intend to keep. Be frugal. Recycle. Reuse. I have written in detail about how to stress less here. This year we are committed to working less. Sometimes, when we have little children to look after and they are especially demanding, things do get out of hand. I keep reminding myself this all the time. Life happens. We get sick, we get busy but the most important thing is to not let a little detour on our journey to a happier life, keep us from our goal. On that note, I’d like to wish you a happy enjoyable new year! I especially agree with your point about routines. With little ones in the house, it is better to be sure that we do things according to the rhythm of the day/week than to check off to do lists but throw off the rhythm.